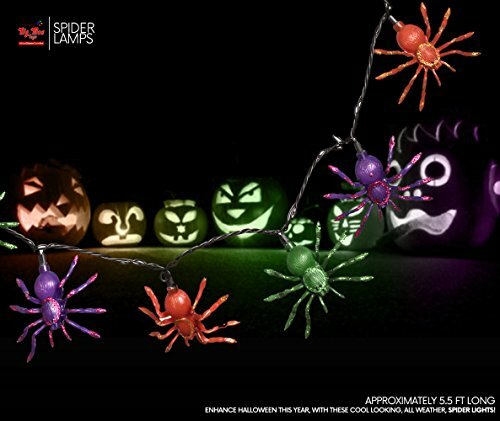 Big Mo's Toys Spider LED String Lights include a 5.5ft string with 10 5"x4" evenly spaced plastic glitter spiders. They are connected by a strong cable that won't tear easily. They are powered by an outlet. You can connect one to another to form a longer string. The LED bulbs are replaceable. Just pull off the plastic spider and replace the bulb. The pack includes 4 spare bulbs. These are great for introducing that creepy Halloween look to your house. Connected by a strong wire, these will last a while. Powered by an outlet. Can connect them to form a longer string. Creates that creepy fun air you're seeking. Great For Halloween or Halloween themed parties, or just to play tricks. They dress up the porch, front path or yard. If you have any questions about this product by Big Mo's Toys, contact us by completing and submitting the form below. If you are looking for a specif part number, please include it with your message.